People don’t fully understand the power of what they can find in the gray. Unlike human perception, computing is linear: systems are built to follow the rules exactly as outlined. If it isn’t a yes, then it must be a no. We live in a world that is full of shades of gray, half-truths and indefinite possibilities. We scan and find patterns: we see the big picture first and then zoom in on the details we find interesting. Most business intelligence and visualization tools are good at answering the first question someone might ask, such as “What are my best-selling goods?” or “Who are my top customers?” The tough part is answering the subsequent question based on the answer to the first question, and then the third and fourth questions, and so on. I’m not talking just about drilling down, which while useful, does not go far enough. The greater difficulty is making it possible for a business user to answer any question they come up with in highly intuitive, interactive, and visual way. When we launched our original QlikView product, we introduced what we refer to as the “Power of Gray” through the patented Associative Experience that Qlik provides. Users literally see relationships in the data. They can see not just which data is associated with the user’s selections – they can just as easily see which data is not associated. How? The user’s selections are highlighted in green. Values related to the user’s selection are highlighted in white. Unrelated data is highlighted in gray – and the gray is where the power lies. With the launch of our latest product this past September, Qlik Sense, we took it a step further with the premiere of our very own “shades of gray”. 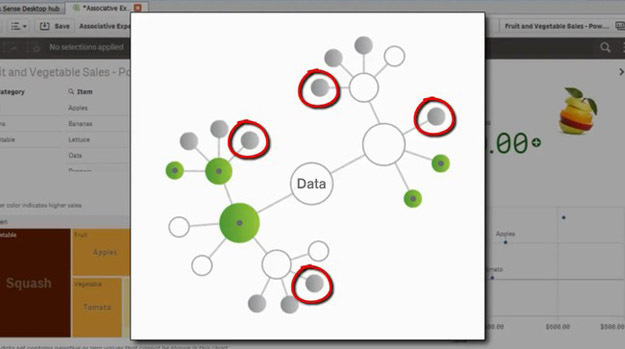 Qlik Sense allow users to see how much of the information associated with their “deep dives” or slices of data by highlighting information in shades of gray to show degrees of association with the current data set. These light gray “hints” provoke thought into other questions the user may want to ask. For example, one global cosmetics company used Qlik to examine its supply chain after a natural disaster. As decision makers began to explore the data, they made a discovery in not which supplier had the specialized ingredient they needed, but which supplier was in the gray. The supplier disassociated from the query as not having the supply at hand because of the impact of the disaster. This ingredient was due to be used in a major product launch that would now be impossible. They then could see the associations between the product launch and a large impending advertising spend. Using Qlik, the brand manager was able to take action and cancel the ad campaign, knowing the product would not be ready. This is just one example of a simple gray list box that changed a corporate strategy. Associations are the key discovery and the shades of gray were implemented to give visual degrees of separation from the query. We find that people don’t fully understand the power of what they can find in the gray until they use Qlik. People are not used to asking what was sold and finding the biggest insight was gained from what was not sold. Have you had an experience with Qlik like this? If so I’d love to hear your “Power of Gray” story.